85°C Bakery Cafe is a self-serve bakery chain from Taiwan. They’ve had stores in Southern California since 2009. On November 5, 2013, they finally opened their first store in Northern California, in Newark, CA. They will be opening their San Jose, CA store in April. The Newark location has only been open for 8 weeks now, and I’ve been there 16 times since then. Call me crazy…but almost everytime I go, there’s a line that starts when you pick up your tray and tongs at the breads side. The most popular signature items, the marble taro and brioche, are usually held behind the cash registers. They do that because during the first grand opening weekend, customers literally fought for them, as soon as the marble taro and brioche were brought outside. So, it’s now a first come, first serve at the cash registers. There is seldom a line at the drinks and cakes side. 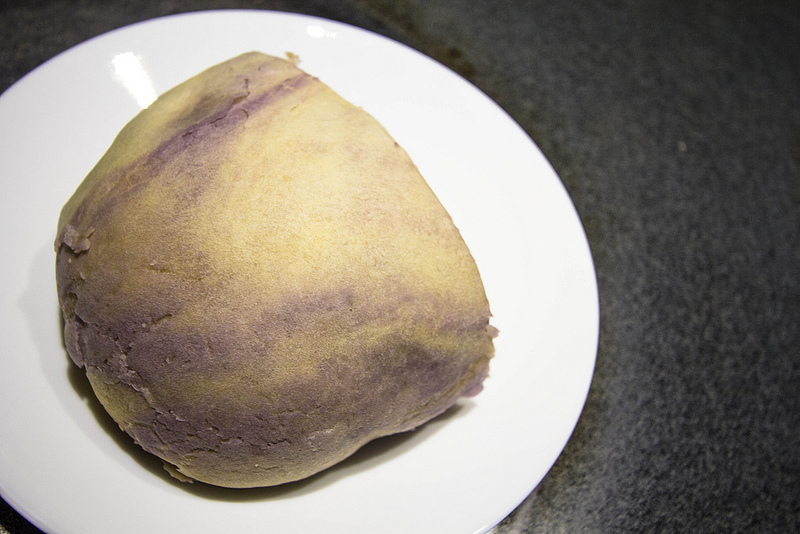 The marble taro is shown above; the marble taro was cut in half. This was my breakfast this morning! My favorite breads are the milk pudding, red bean, rose, marble taro, and taro breads. I’m actually not a fan of taro, but I liked 85°C Bakery Cafe’s taro breads. I find the consistency and sweetness different than how taro usually is. I also like the mini cheesecake bites, and mochi egg tart. Go on weekdays. I usually go after work, and haven’t had to wait that long after picking my breads. I never go on a weekend unless I have to, cuz it’s busier on weekends. Just don’t ever go 30 minutes before closing time, as that’s when they start taking away the breads and only leave pastries. I went couple times around 5:30pm weekdays. Just watch out for traffic.